The big island of Hawaii is one of the most unique places on Earth. 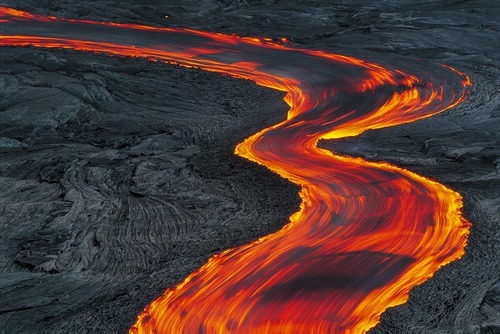 Miles of lava fields, barren and raw, rich green valleys nestled between massive volcanos, towering cliffs laced with giant waterfalls, and most intriguing of all, Kilauea volcano with it’s seemingly endless rivers of hot flowing lava. 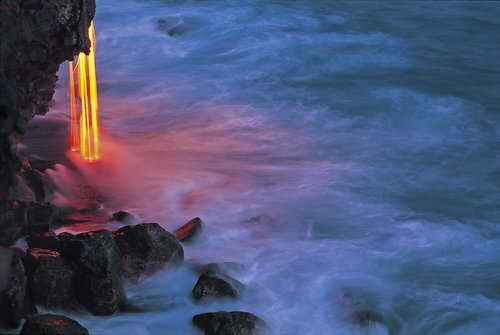 Active since 1983, Kilauea invites locals and visitors alike to witness creation as it’s happening. People come from around the world to have a personal experience of this amazing display of nature, flying in helicopters, hiking over solidified lava, often tempting fate, simply to witness the majesty of the Earth birthing itself in the form of new land. Human beings seem to have an innate curiosity to behold the beauty of that which sits just at the edge of comprehension. No one knows this better than volcano man, G. Brad Lewis. A born lover of nature, Lewis grew up in Utah, at the edge of the Wasatch Mountains. As a child, he spent much of his time playing in the wilderness. When talking with him about his early years, it came as no surprise to learn that on his sixth birthday, his mother gave him a Brownie camera. This was when he began taking pictures of what he loved most. “I have always had a great reverence for nature and beauty”, says Lewis. As a kid, this was my home, and when I was a teenager I spent a lot of time alone in the mountains. That’s where I found my contentment. It became my church. Beauty has lead me to each place I have been”. In 1978, after graduating from the University of Utah, Lewis found himself drawn to the profound beauty of Alaska. Once there, he acquired a piece of land and built himself a cabin with a panoramic view of five active volcanoes. He was sure this would be his home for the rest of his life. Though he still has this cabin, little did he know at the time that what awaited him was the beginning of an unfolding journey that would lead him into a relationship that for most of us, lies far, far beyond the imagination. The relationship I speak of is that with Kilauea volcano, and it's reigning goddess, Pele. Interestingly, at the same time that Brad Lewis is capturing the beauty of creation in process, he is also supporting science. Over the past ten years, he has supplied the local scientific community with detailed pictures that provide them with up to date information for research. It’ is this service that has given him his ticket to go beyond the "no trespassing" signs and enter into the most intimate spaces with this mountain of fire. It seems as though they were meant to be together. G. Brad Lewis is well positioned to witness the unfolding of Earth's agenda. From his early beginnings with his Brownie camera, through the great expanse of Alaska, to the hot flowing lava of Kilauea, this unfolding story of a greater plan embracing the life of a single human being, so beautifully expressed through art. How fortunate we are to behold this extraordinary relationship between scientist and volcano, photographer and beauty, man and goddess. It is truly a blessing for all. Mahalo Brad for your beautiful contribution to the planet. All photographs appearing on this site are the COPYRIGHTED PROPERTY of G. BRAD LEWIS, and are available for usage by license only. No form of reproduction or manipulation , including copying or saving as a digital file is permitted. Any unauthorized usage of these images will be prosecuted to the full extent of the U.S. Copyright Law.